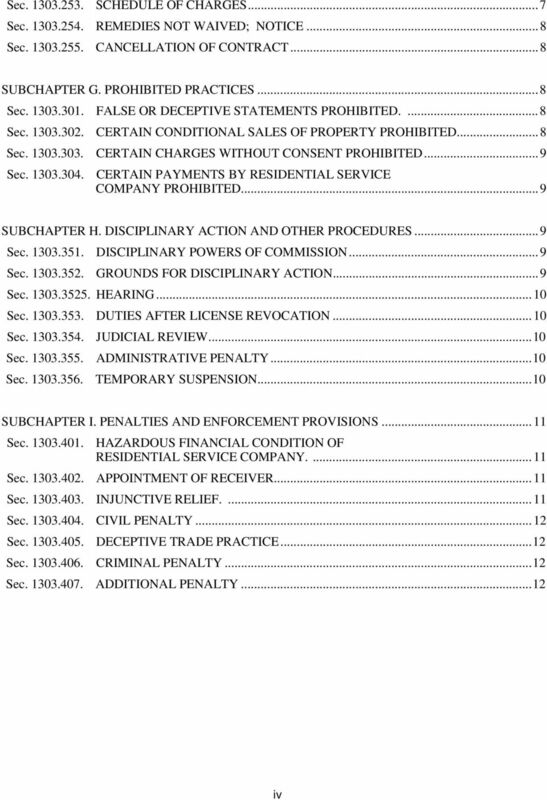 Download "OCCUPATIONS CODE TITLE 8. 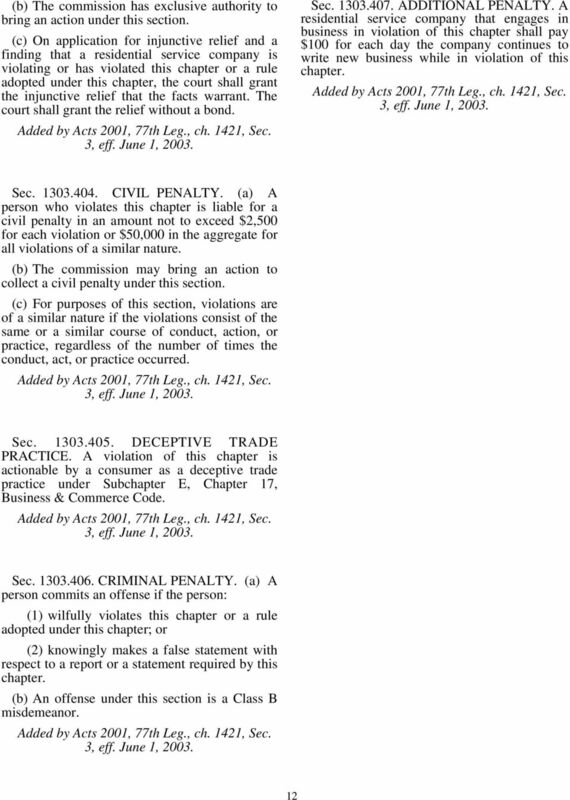 REGULATION OF ENVIRONMENTAL AND INDUSTRIAL TRADES CHAPTER 1303. RESIDENTIAL SERVICE COMPANIES. As Revised and in Effect on"
6 Sec APPLICABILITY TO CERTAIN AGREEMENTS. 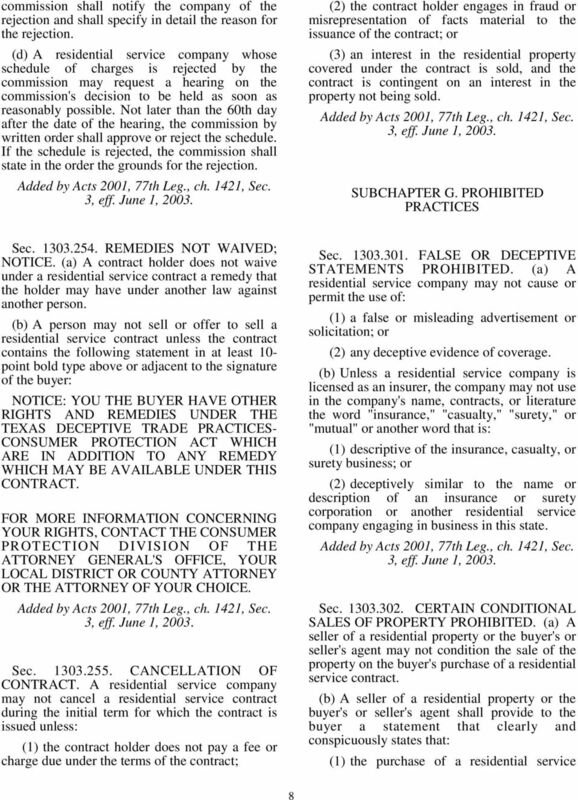 This chapter does not apply to: (1) a performance guarantee given by: (A) the builder of a residential property; or (B) the manufacturer or seller of an appliance or other system or component of a residential property; (2) a residential service contract executed before August 28, 1979; (3) a service contract, guarantee, or warranty that is: (A) designed to guarantee or warrant the repair or service of an appliance, system, or component of a residential property; and (B) issued by a person who: (i) does not engage in the business of a residential service company; and (ii) sells, services, repairs, or replaces the appliance, system, or component at the time or before the contract, guarantee, or warranty is issued; (4) a service or maintenance agreement or a warranty that: (A) is sold, offered for sale, or issued by a manufacturer or merchant who manufactures or sells a product or part of a product, including a structural component, an appliance, or an electrical, plumbing, heating, cooling, or airconditioning system of a building or residence; and (B) provides for, warrants, or guarantees the maintenance, repair, replacement, or performance of the product or part of the product; or (5) home warranty insurance as defined by Section 2, Article 5.53-A, Insurance Code. 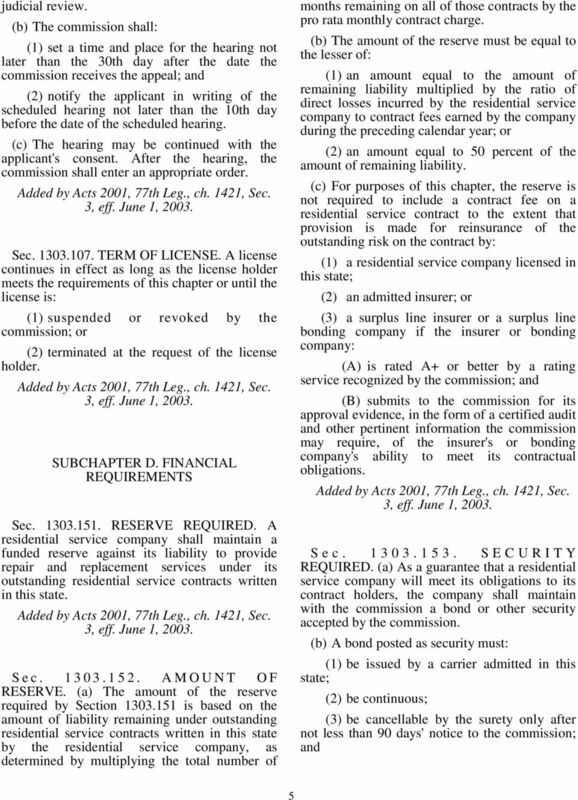 Sec LIABILITY FOR CERTAIN ACTIONS BY AGENT. 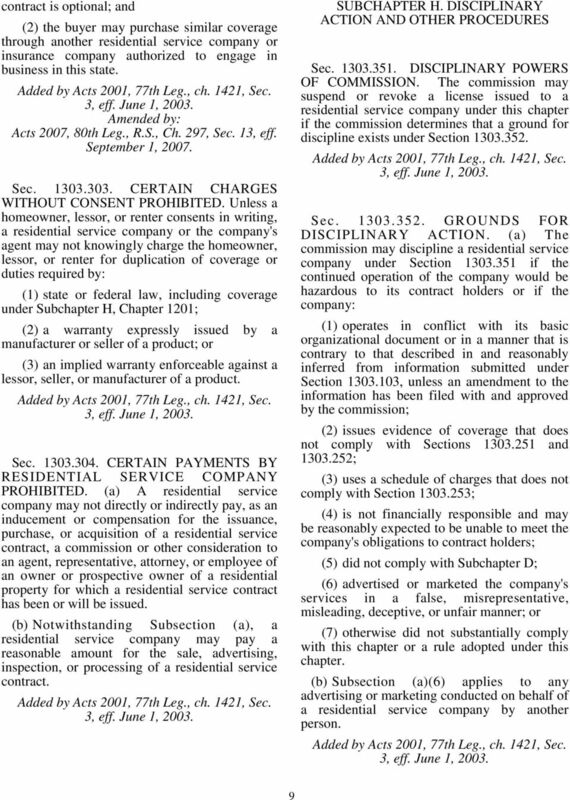 This chapter does not exempt a residential service company from common law or statutory liability for an action taken by the company's agent or representative 2 that is relevant to the conduct of the company's business. SUBCHAPTER B. 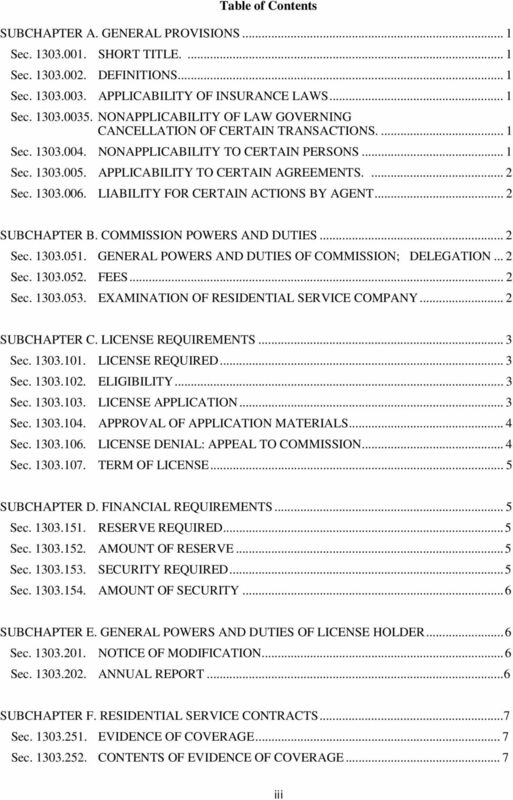 COMMISSION POWERS AND DUTIES Sec GENERAL POWERS AND DUTIES OF COMMISSION; DELEGATION. 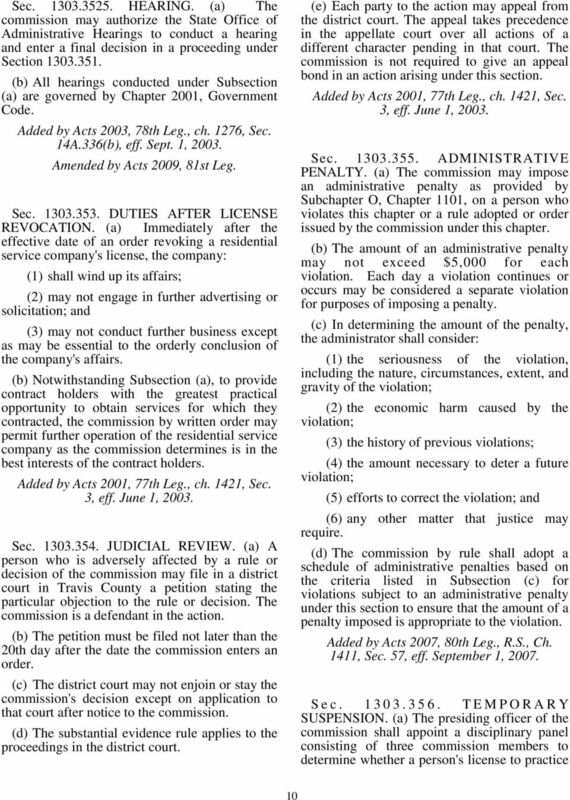 (a) The commission shall administer this chapter and may adopt and enforce rules necessary to implement this chapter. 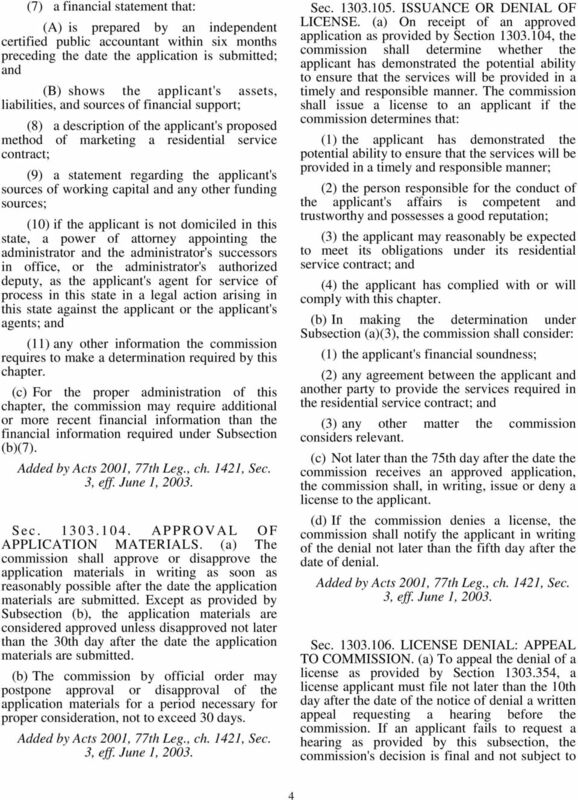 (b) The commission may delegate a power, right, or duty under this chapter to the administrator or assistant administrator of the commission. Sec FEES. 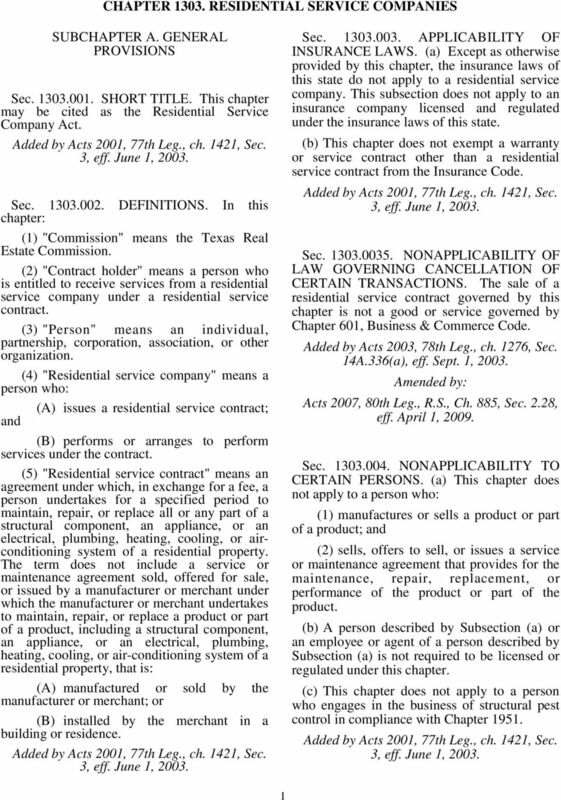 (a) A residential service company must pay to the commission a fee for filing an application for a license or an amendment to the application. 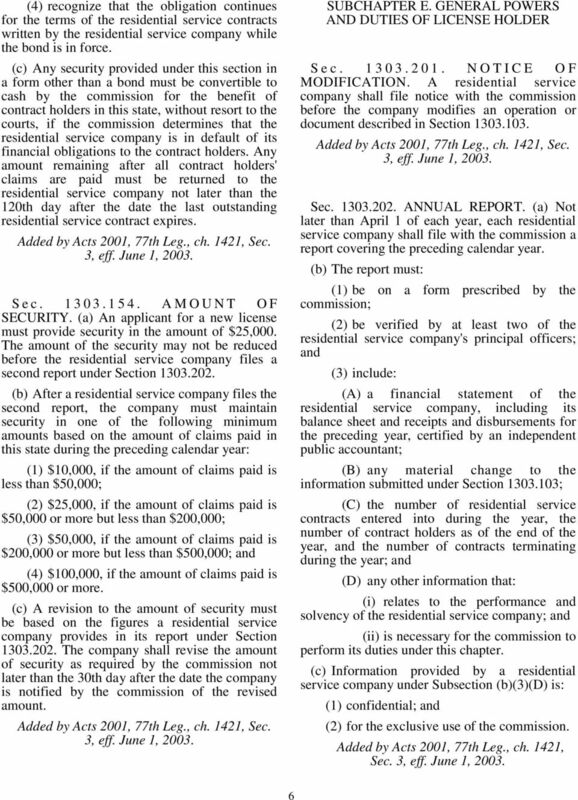 (b) A residential service company shall pay to the commission a fee for: (1) filing an annual report under Section ; and (2) any other filing required by this chapter. 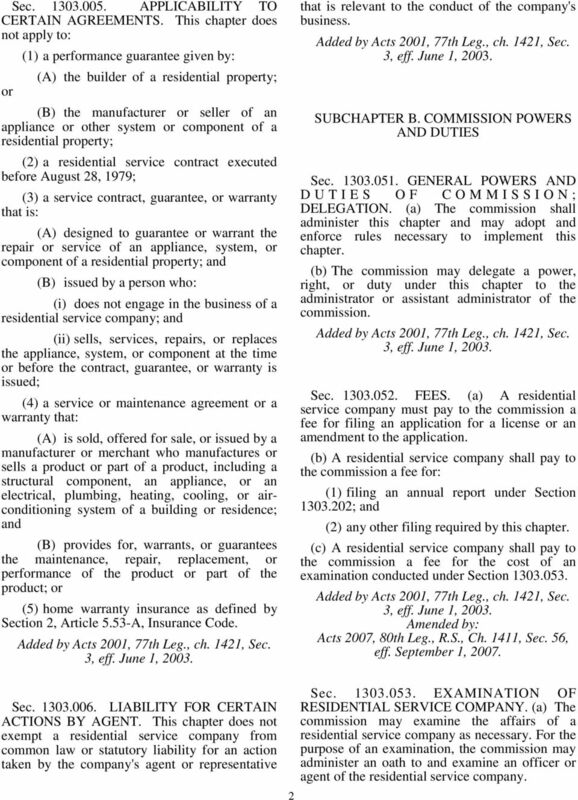 (c) A residential service company shall pay to the commission a fee for the cost of an examination conducted under Section Amended by: Acts 2007, 80th Leg., R.S., Ch. 1411, Sec. 56, eff. 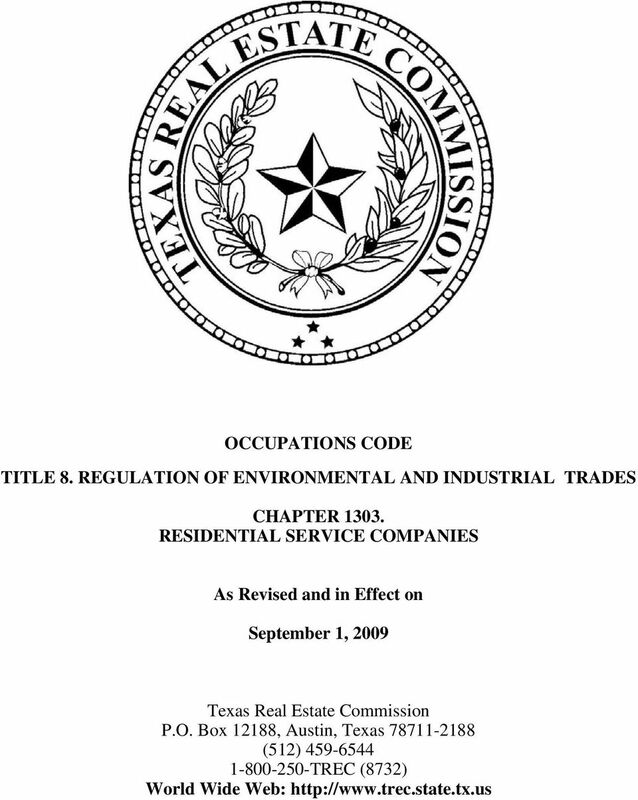 September 1, Sec EXAMINATION OF RESIDENTIAL SERVICE COMPANY. 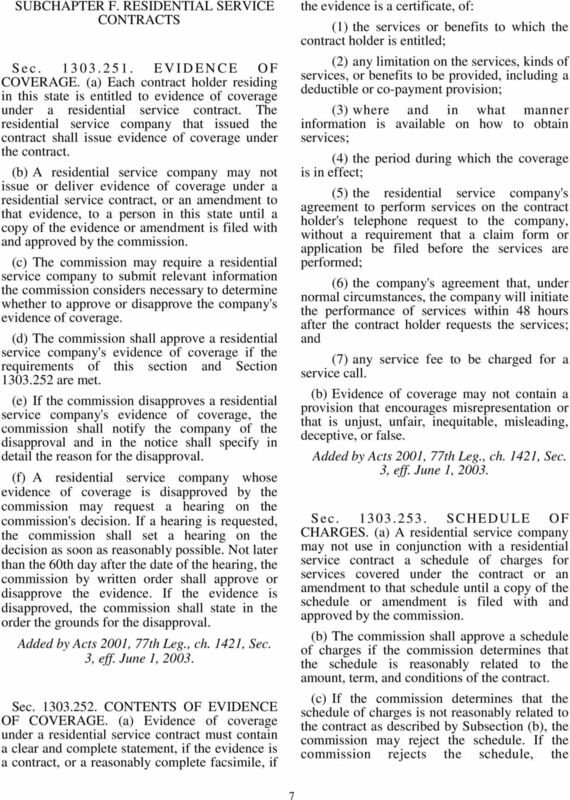 (a) The commission may examine the affairs of a residential service company as necessary. 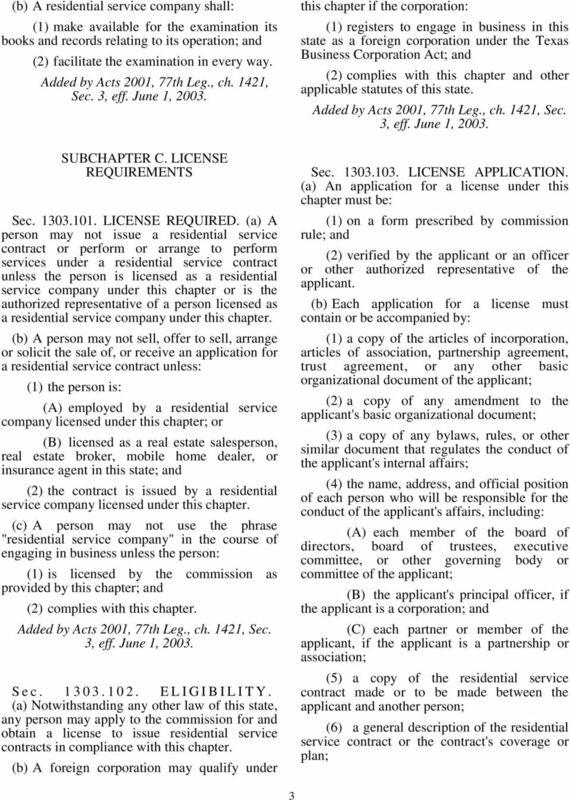 For the purpose of an examination, the commission may administer an oath to and examine an officer or agent of the residential service company. How to stay out of HOT water? BILL ANALYSIS. S.B. 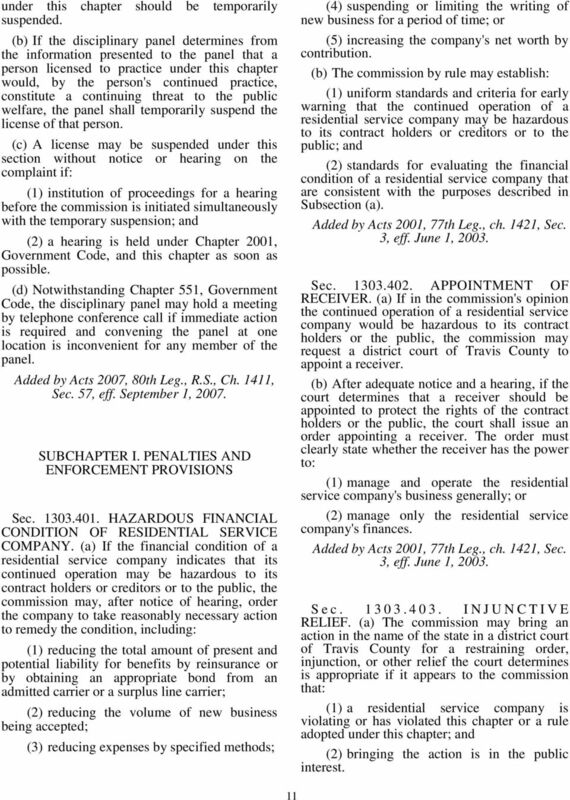 1399 amends current law relating to the regulation of foundation repair contractors and provides a penalty.